Its time for another Art Jewelry Elements Earring Challenge Reveal. For those of you who are new to this blog, the challenge is to make a pair of earrings, each week, that use at least one artisan component. This pair of earrings would be perfect for a holiday party, perhaps a New Years Eve celebration. They have a sophisticated elegance about them. The earrings are 3 inches long, lending a touch of drama. I wrapped a silver wire in a graceful curve across the face of the lavender bead at the top. 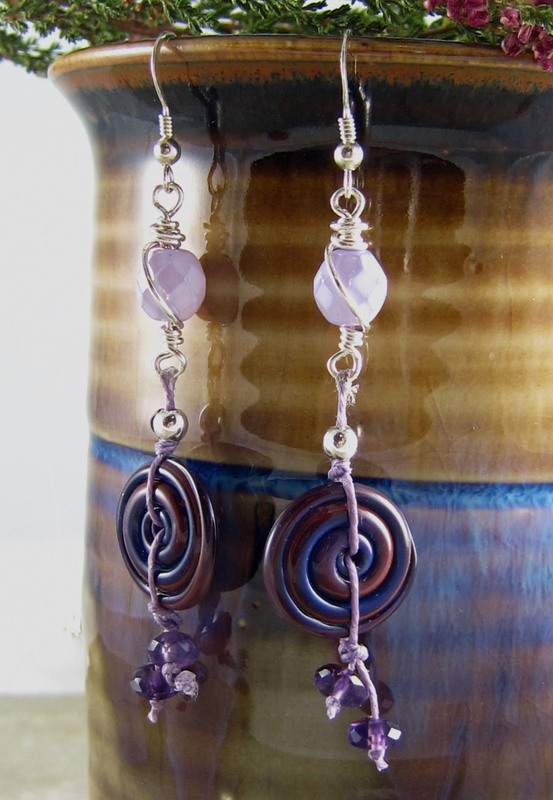 Below that, I strung lampwork discs on Irish linen cording and let two faceted amethysts dangle beneath each disc. 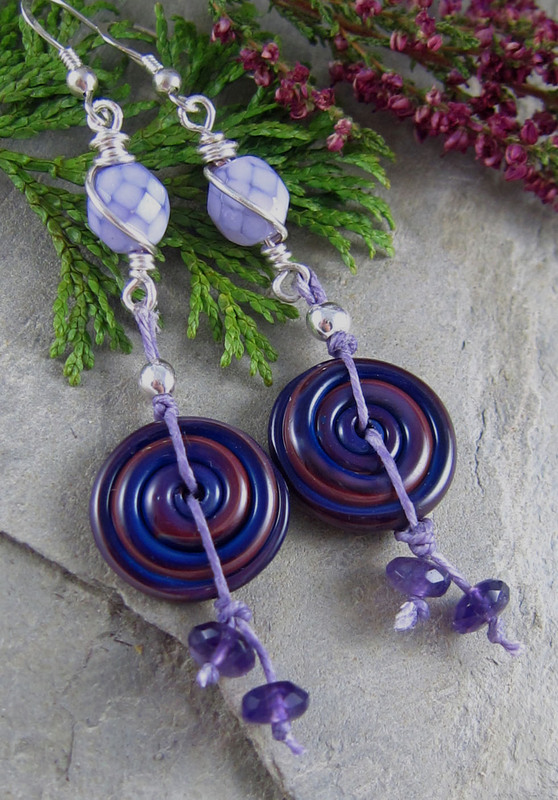 I really love the spiral of violet and blue on each handmade glass disc. The colors and texture make them extra special. 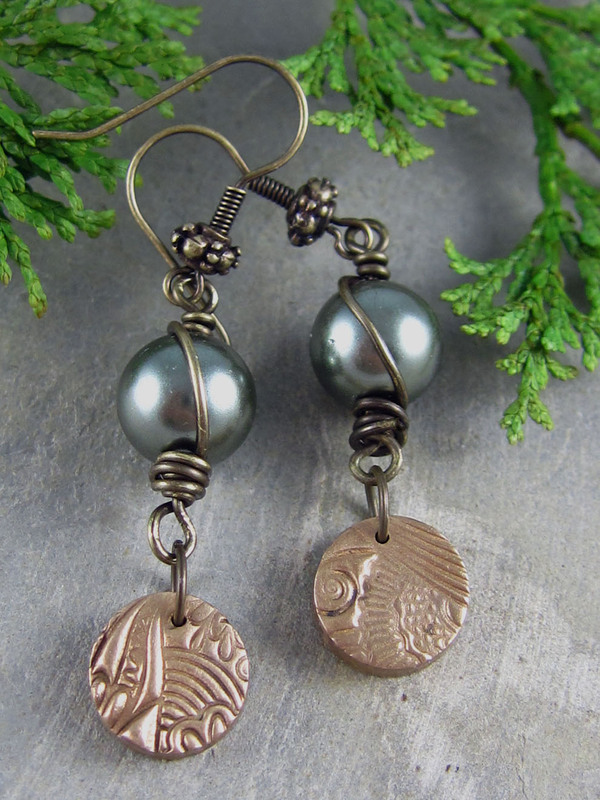 My second pair of earrings have the same graceful wire wrap at the top, but this time, it curves across the face of shimmering blue-green shell pearls. I love the color combination of sage green and brass. 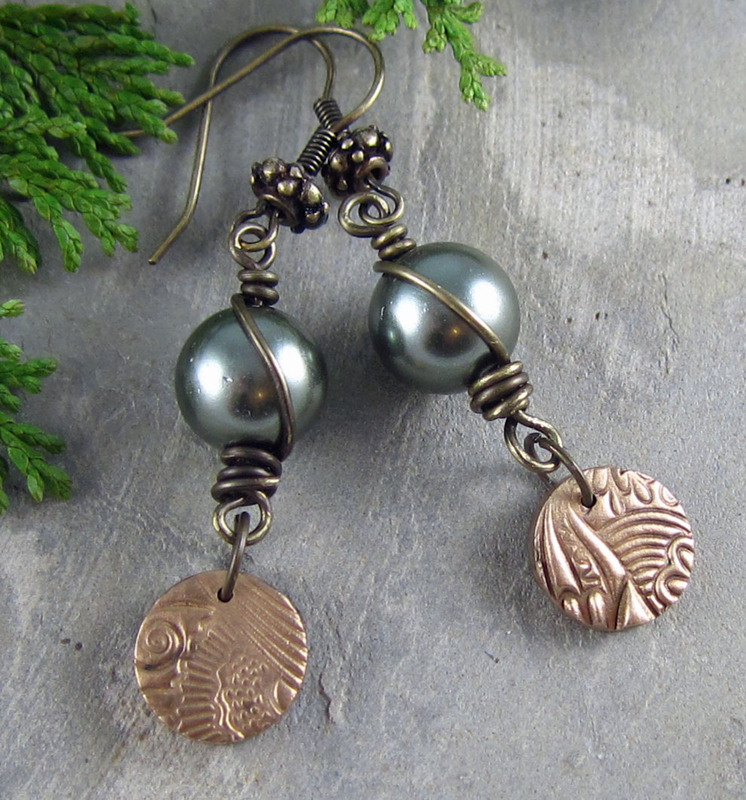 Speaking of brass, the pretty textured brass dangles were made by Free Individual, on Etsy. The artist lives a bit north of me in Seattle, WA. Want to see more gorgeous earrings? Head on over to Art Jewelry Elements for links to the other Earring Reveal blog posts! We also have an AJE Earring Challenge Board on Pinterest. This entry was posted in Art Beads and Components, Bead And Jewelry Challenges and tagged Art Beads, Art Jewelry Elements, bead blog, blog hop, earrings, fashion, handmade earrings, handmade jewelry, lampwork glass, Linda Landig Jewelry by Linda Landig. Bookmark the permalink. You always design the best earrings, Linda! Both are stunning beauties! So pretty! I especially love that green and brass pair. Pretty pretty pretty, I love me some purple!! Catherine is right you always make such wonderful earrings and jewelry too!